Whiskey Girl is proudly distilled by Dark Corner Distillery in Greenville, SC. We’re open every day but Sunday for tastings, cocktails, and shopping. Dark Corner Distillery is a craft micro distillery located in Greenville, South Carolina. Our focus is on producing small batches of world class spirits inspired by our Southern heritage. Everything is handcrafted with the best ingredients we can source. We love sharing our distilled spirits and rich Appalachian heritage with others. Our distillation system was designed by the founder of the distillery to favor quality and taste. We firmly believe that the use of time-honored methods and equipment with quality ingredients and a measured hand will lead to the best spirits you can find. We’ve won countless awards on our spirits including The World’s Best Moonshine, Whiskey Girl, Jocassee Gin, Lewis Redmond Whiskey, and more. We’d love for you to pay us a visit new time you’re in Greenville! Contact us for info on distillery tours. Born and raised in Virginia, Paul’s passion for alcohol began at a young age in a household where beer was home brewed. He earned a BS in Culinary Arts and Foodservice Management with a concentration in Beverage Management from Johnson and Wales University and also holds a WSET Level 2 Professional Certificate in Spirits. 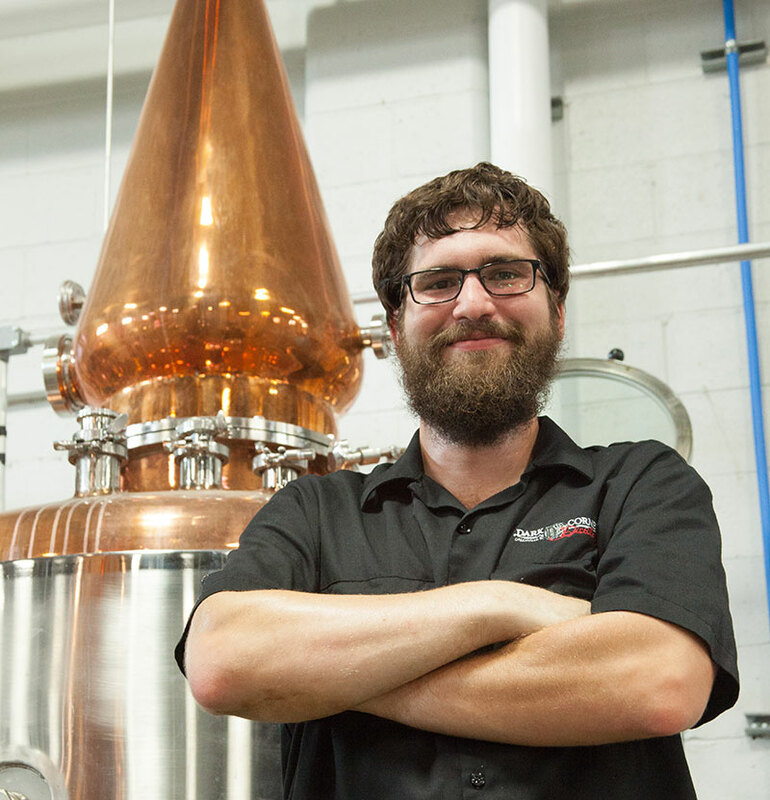 He takes great pride in every spirit he makes and honors old traditions of distilling while adding new and local twists. Our award-winning spirits are a testament to his unique and talented approach to distilling. When he’s not working, he spends his free time combing his beard, panning for gold and playing with his pit-bull, Nola.